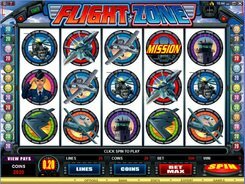 Flight Zone is an aircraft-themed action-packed slot featuring last generation jet fighters and a high winning potential. Apart from supersonic jets and helicopters, the symbols are the air control tower, pilot and even a female communication officer. 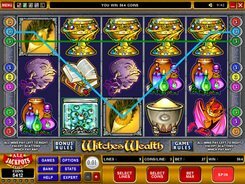 To start off, you need to wager up to twenty coins per line. The top bet per spin equals $100. The Flight Zone logo represents a wild symbol. It offers an invaluable help by substituting other regular symbols. 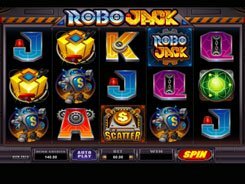 Besides, five logos pay out a grand jackpot worth 1000 coins. 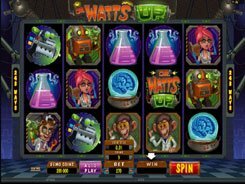 The main game’s jackpot is by far not high, but you can win big in extra bonus features. The Mission bonus game is triggered by three Cockpit symbols. In the first level of the bonus feature you use three missiles to destroy enemy targets. Your aim is to uncover 3 fuel tanks to proceed to the second level. In the next level you’ll have to chase five terrorist trucks and destroy one of them using a remaining missile. Your reward will vary from 1000 to 8000 coins, depending on the target you have attacked. Two Guided Missile symbols appeared on reels 1 and 5 activate ten free games at a x2 multiplier. The free spins feature can be re-triggered if two Guided Missiles hit again on the first and fifth reels during the free spins round. PLAY FOR REAL MONEY!